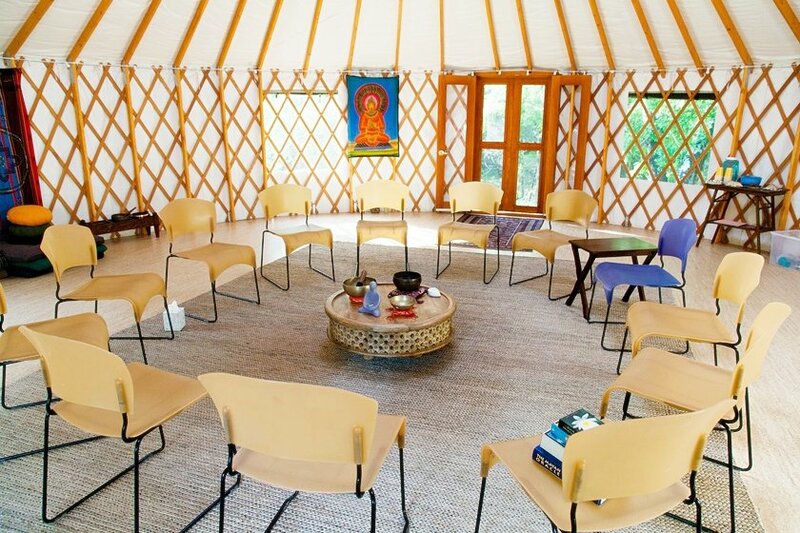 Dharma Ranch is available year round to rent for group retreats, classes and workshops. 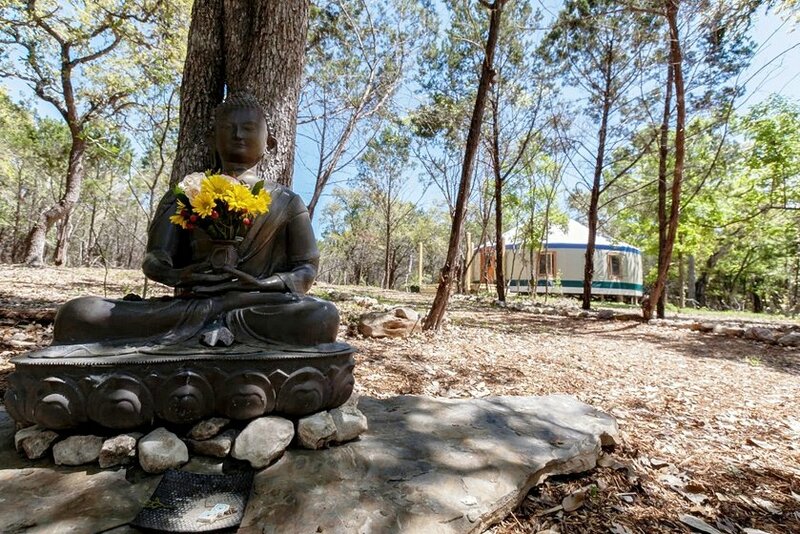 Our peaceful surroundings create an inviting place for daylong meditation and yoga retreats, educational training, personal development workshops and classes, spiritual retreats and workplace team building. 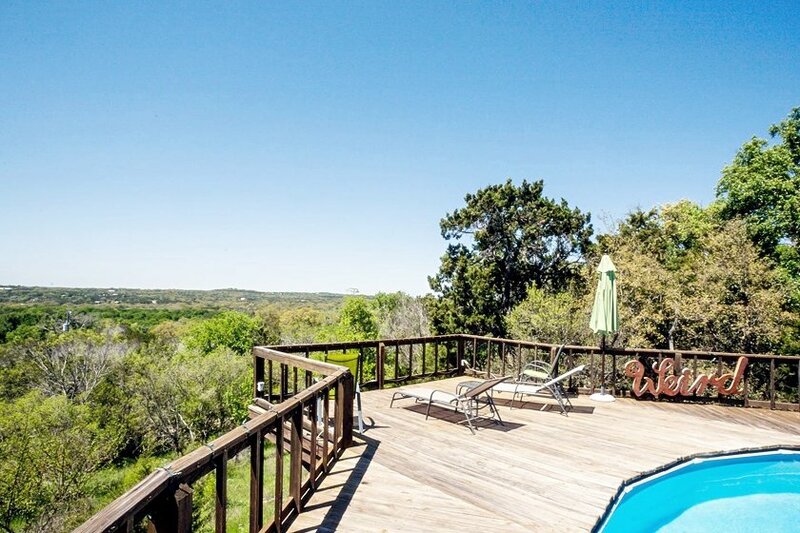 We are located 6 miles from downtown San Marcos, Texas on 10 wooded acres overlooking a valley that offers extraordinary sunset views. 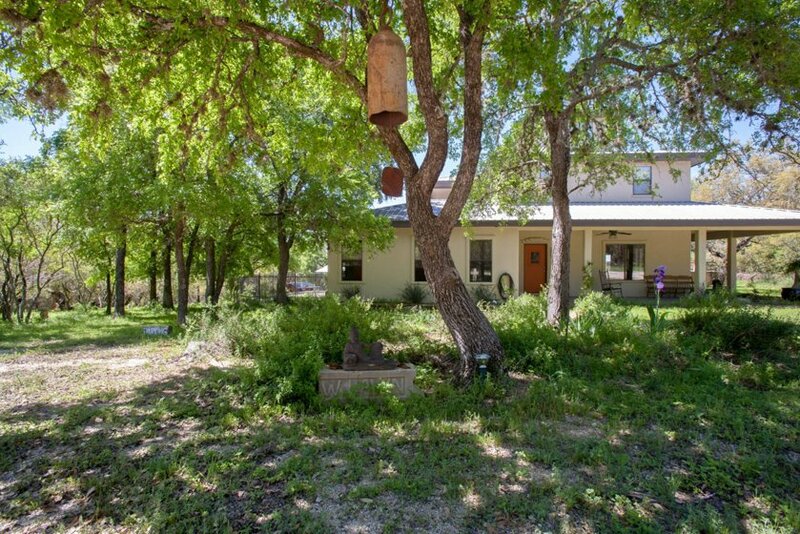 Dharma Ranch is a Buddhist inspired center that welcomes peaceful and open minded people of all spiritual and healing paths desiring a sacred space to gather or take refuge from the busy world. for all who seek a peaceful heart and a life wide awake. What makes us unique is our amazing 30ft Yurt that energetically creates a magical space for truth telling, listening and powerful witnessing. The spacious outdoor deck and Main House a short walking distance away, offers added accommodation for break out groups or relaxation. Our full kitchen will always be open and stocked with healthy snacks, hot coffee and tea. Cooking or catering use available for a fee. 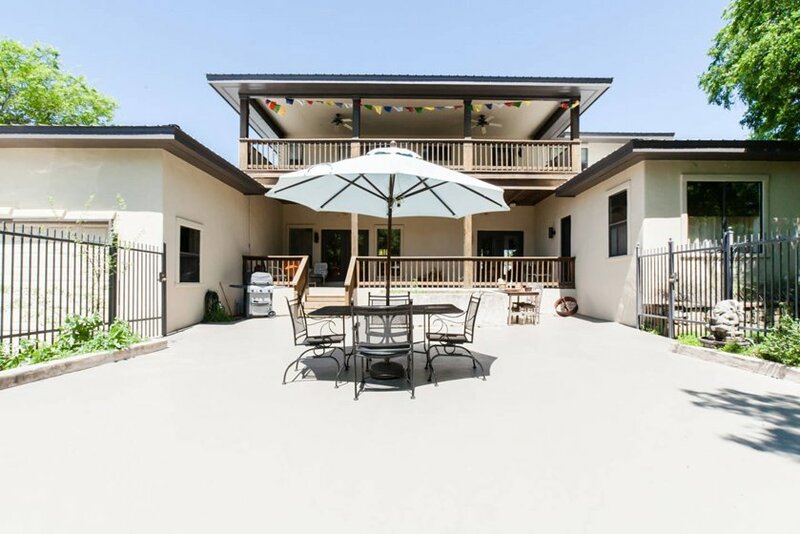 The property includes a hillside deck and pool that offers a refreshing swim and sunset viewing, walking trails and several quaint sitting areas scattered throughout the land for quiet contemplation and conversation. Dharma Ranch is a place where people come to explore and share their curiosities and passions with each other and to seek deeper truths. Teachers are drawn here to share their wisdom, practices and inspiration for all who seek to live life wide awake with an open heart and mind. Our center is dedicated to intimate groups of 30 or less and is a day use and evening facility. We do have a Tiny House for event accommodations or personal stays. 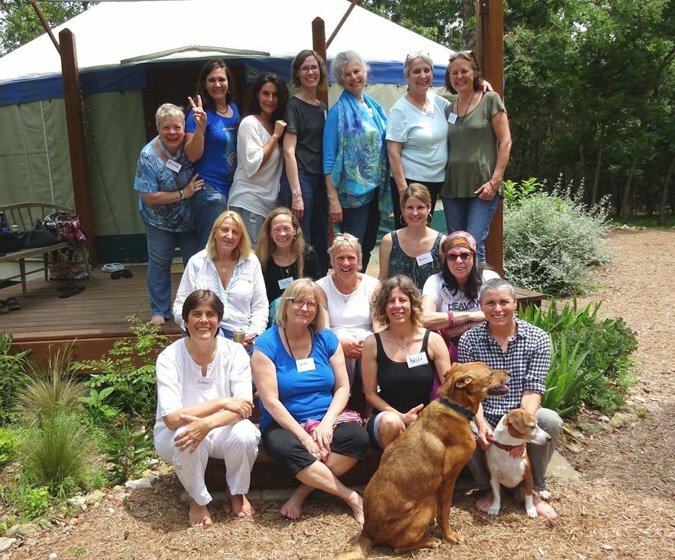 We host a variety of retreats and workshops from meditation, dance, yoga, healing, energy work, creativity, coaching and much more. Dharma Ranch offers a serene, safe place where people can learn practices and tools to live a more awake and fulfilled life. Various classes are led by local teachers each week and are offered for a suggested donation. Everyone is welcome! Our community is committed to a more connected and kinder world where everybody feels like they belong. We have a wonderful community of people from all walks of life. Join us! Our weekend in San Marcos was rainy (and busy!!) but we felt so cozy and content at Dharma Ranch. There are countless charming and quirky details all around that made us feel welcomed, and right at home. Susan and Kelli were extremely accommodating to us; they were always in touch when we needed them before and during the trip, but gave us ample privacy during our stay. They provided us with everything we could have needed, so we indulged in coffee, movies, the best naps under the comfiest blankets, and of course some restorative yoga out in the yurt, too! Truly, it was the perfect escape from the bustle of San Marcos. I started the weekend off full of stress — we left town later than we hoped because I was locked out of my home, hit rush hour traffic, and upon arrival, I realized I forgot my hanging clothes at my house — BUT the energy here calmed and soothed my nerves immediately. After spending just a few hours unplugged from my phone and emerged in this space, it was enough to recenter me on what I was in San Marcos to do — joyfully celebrate dear friends’ birthdays and graduations. Thank you, Kelli and Susan for opening your home to us! Many times throughout our stay, we looked at each other and sighed “I *really* like this place.” We cannot wait to return! This was our first experience with Airbnb and thanks to our amazing hosts along with their beautiful home and surrounding will not be our last. Everything in their listing was so accurate and so enhanced our romantic Valentine’s weekend their. I can’t accurately describe their beautiful place and all the time, love, and work they have put into this place to make it so very peaceful, serene, and comfortable feeling not only for themselves but their guests. The yurt was stunning and we had to just sit inside and take in the beauty and peace. Walking the property was breathtaking with gorgeous trails, statues, some cool chickens and Rusty the rooster who is stunning! Loved being able to hold him and learn about them some! The sunsets oh the sunsets what a view! We rushed the second night to assure we did not miss that sunset from the pool deck! The stars at night and just the noises of nature was absolutely fantastic. The room was the most comfortable and relaxing in the way they had it furnished and decorated. Loved the bed so very comfortable in fact didn’t wake up once during the night with the combination of the amazing bed and the cool night breeze and sounds from being able to sleep with the windows open. The bathroom was wonderful and supplied with ALL the great amenities as they listed. Great jacuzzi tub! Loved the way they had the microwave, the fridge, Keurig, toaster oven, purified water, electric kettle! They as well had stocked the fridge as stated and provide us the option to have a few choices for breakfast. We were able to use their grill to cook our Valentine’s dinner. Had an outstanding romantic evening. Susan & Kelli knew we had planned on celebrating Valentine’s Day on Saturday with dinner that night and it was amazing like we had the whole property to ourselves. Was super romantic. Our last night there I had asked if they could answer some questions before we left in the morning. Not only did the answer all our questions we had the following morning but they asked us to join them breakfast. So very kind and thoughtful! Ken and I enjoyed that. Not only have we found a new place to stay when we are in that area but we have made new friends and reacquainted with old. We can’t wait to go back and this time stay in the airstream. Could not stop talking about how wonderful of a Valentine’s weekend it was. Thank you both for such amazing, kind, and caring hospitality. What a outstanding home y’all have that you chose to share with others. The experience here is even more amazing than the description and photos portray. Everything is as described, and then some. 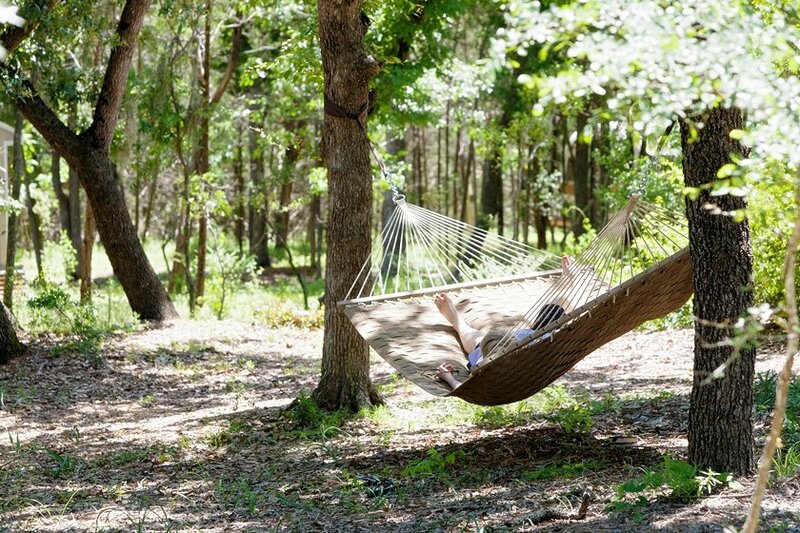 If you’re looking to find your center, or rediscover it, then look no farther than Dharma Ranch. No area hotel can match this peaceful, beautiful setting… no matter how many stars. Stars? Dharma Ranch boasts about a billion of them that you can take in from the scenic deck… so a 5-star rating would be a bit of an understatement for this place, to the last detail. We’ll give our hosts 5 stars, to be sure. Our stay was a bit of a rush on our end, though even with that, our rush was so easily left at the entrance gate. We have children who will be attending nearby Texas State University – a mere ten-minute drive. Rest assured, we will be staying here again… and again. Rest assured? It sure is at this place. 5 stars… give or take a billion. We had an incredible one night at Dharma Ranch. The only thing that could have been better was if we could have stayed longer! The property is gorgeous and peaceful. The apartment was immaculate, well decorated, and private. We loved the jacuzzi tub and porch where we grilled dinner in the company of Monkey the Cat. Kelli and Susan were warm and welcoming but respected our privacy. We couldn’t have asked for a better getaway from Austin. Can’t wait to go back! 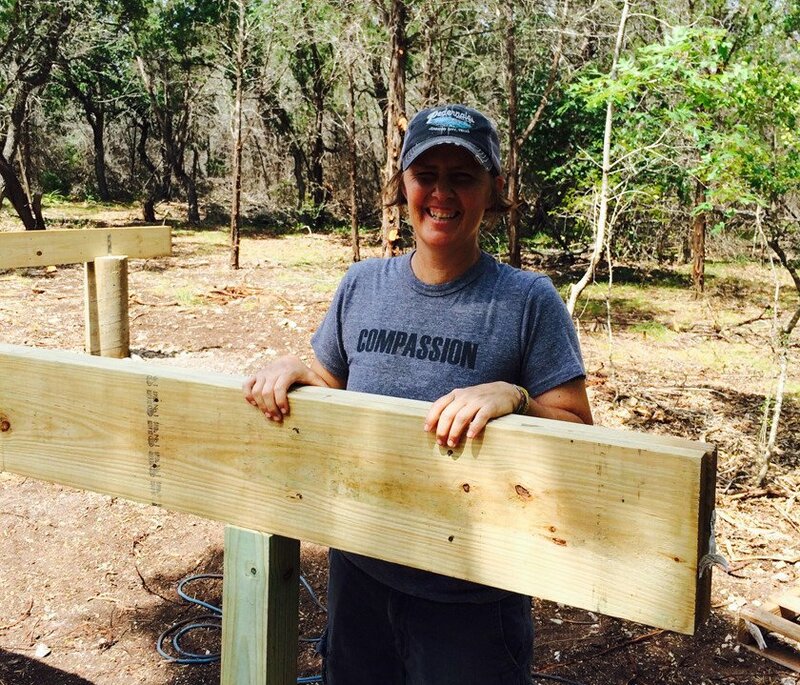 I am overly grateful for my experience at the Dharma Ranch with Kelli & Susan. The place was immaculately clean & peaceful. Their genuine care for the ease of my stay was very appreciated & loved  I will definitely be back very soon! I’m happy for anyone that decides to stay with them in their beautiful space! If you have a chance to stay here, STAY HERE. The hosts were awesome, very welcoming. The place I cannot rave about enough. The view, deer running around the property, great coffee, hiking paths, pool for the warmer weather. The bathroom, so nice and jacuzzi tub. Living room very well appointed, bedroom well 5 star hotels wish they were this nice, well at least the last one I stated at. This place is amazing. Kelli and Susan have created a really unique peaceful environment here, and it was perfect for our little getaway. The yoga & meditation yurt was pretty awesome too! Highly recommend staying here. There’s really not much more to say that hasn’t already been said by other reviewers. Our stay at the ranch was fantastic in every aspect! Both Kelli & Susan were awesome hosts, from the the moment of the original booking they were thorough in answering any questions and also providing us helpful special directions to find the place. Once we arrived Kelli showed us around and helped us get settled in. The property is even more breathe taking in person, with little details through out that really make it a very special place. You can really feel the love they’ve put into making the ranch a place to relax and recharge oneself. As far as the room and bathroom all I can say is wow! The decor is beautiful and super cozy and having a stocked fridge, clean linens, and an awesome variety of natural and organic toiletries just added to the experience. The cable tv was solid, plus they have a great collection of magazines, books, and DVDs to entertain yourself. Also, downtown San Marcos is just a short drive away, were you can buy groceries, rent movies from the redbox, and grab some eats. Highly recommend the Big Kahuna food truck at the Hitch. Watching the sunset over hill country from the deck was just beautiful and at night you can see so many stars, it was awesome. I definitely plan on returning, and highly recommend this place to anyone looking for a quiet and peaceful nature getaway. Copyright 2018 Dharma Ranch LLC - All Rights Reserved.